This paper approaches Corinne, ou l'Italie through an inter-disciplinary lens, drawing on literary, historical, and digital methodologies. If Corinne is first and foremost a Romantic novel that foregrounds the love plot between Corinne and Oswald, it is as much a novel about the role of women in society, articulated through the figure of the femme de génie. 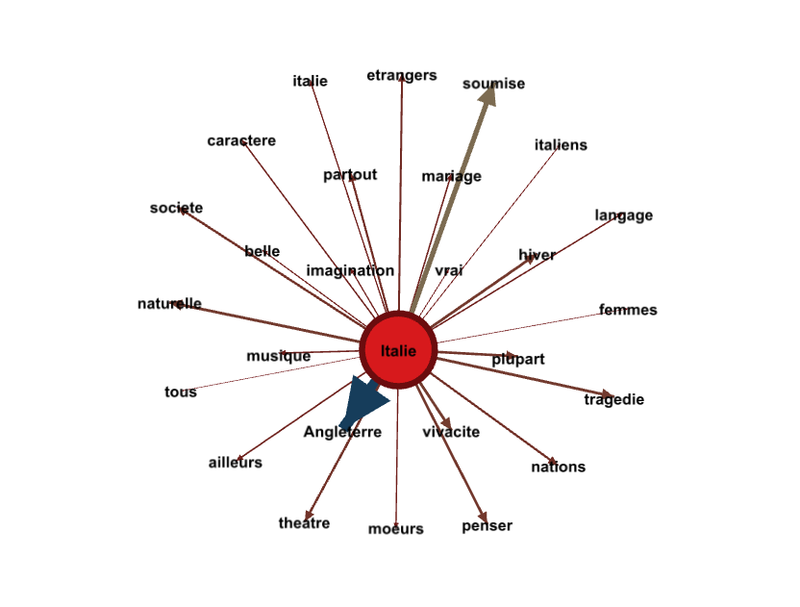 The plot of the femme de génie finds its expression through the trope of sociability, which I analyze through a social network analysis of the characters in the narrative and a computational analysis of collocates. I argue that through the constellation of sociability in the novel and the national allegories that accompany it, Staël evokes an enduring partiality for an Enlightenment ideal of sociability that remains deeply connected with female emancipation. The lens of sociability thus allows for a re-articulation of the novel as a social critique of patriarchal society. The salon is considered the milieu of sociability par excellence in eighteenth-century France, and carries with it mythic associations as an incubator of literary and philosophical discourse. Women, for the most part, governed these spaces of mediation between the gens de lettres and the gens du monde, which allowed for the formation of networks of philosophes, writers, historians, economists, politicians, and aristocrats. Whether the salon served as a motor of the Enlightenment or rather as a place of aristocratic divertissement, the Enlightenment ideal of a vibrant, mixed-gendered salon that thrives on intellectual and literary exchange is precisely the mode of sociability that Madame de Staël championed, both in theory and in practice. Staël inhabited a complex historical position between the Enlightenment and post-revolutionary France. She remained firmly attached not only to the ideas of the Enlightenment, but also to the aristocratic culture of the ancien régime, as evidenced by her desire to repurpose Enlightenment practices of sociability after the Revolution [Baczko 2008]. The society that Staël assembled at the château de Coppet during her time in exile constituted an alternative to the state-run institutions of the 19th century that formally excluded the participation of women, institutions intended to replace the salon of the ancien régime [Hesse 2001, 111]. Staël’s mastery of the 18th-century salon allowed her to expand her sociocultural influence from a Parisian salon in the years leading up to the Revolution to a bastion of intellectual exchange at Coppet, where she perpetuated Enlightenment modes of sociability and fostered female and male intellectual collaboration. Coppet was a place of literary, philosophical and political exchange that occurred between nations as well as across disciplines. It became such a powerful center of influence that Stendhal will refer to Coppet as having been “The Estates General of Europe” [Gray 2008, 221]. A significant amount of the scholarship on Staël takes either a literary or a historical approach. For literary historians, Staël is not only a pioneer of French Romanticism, but she is also an early feminist figure who addresses singularly female conflicts in her theoretical and literary works. Many studies focus on Staël’s biography, from her precocious childhood in Madame Necker’s salon to her own salon on rue du Bac in the years leading up to the Revolution, her efforts to create safe havens abroad for endangered aristocrats during the Terror, the exile and censorship she faced under Napoleon, and her intellectual circle at Coppet. Scholars particularly underscore Staël’s influence in the world of letters and in public affairs on an international level. Recent studies have turned to her role in forging a network that fostered new thought through the exchange of ideas between thinkers from diverse nations, granting Staël a central role in the narrative of European cosmopolitanism that while strong during the Enlightenment, would profoundly mark 19th-century intellectual production. In line with the continued interest in Staël’s practices of sociability, her Enlightenment heritage, and her feminist critique of society, this paper demonstrates how these preoccupations intersect in her novel Corinne . I combine more traditional literary and historical methods with – for the first time – digital methodologies to examine the trope of Enlightenment sociability in the novel. Sociability was far more than a cultural practice for Staël; it constituted a key component of Staël’s political thought. For Staël, the salon was essential in affording women a role in public life. What’s more, as Steven Kale notes, Staël considered the salon to be “the crucible of an enlightened politics, where aristocrats and intellectuals came together to consummate the marriage of politics and philosophy” [Kale 2006, 311]. The ideal mode of Enlightenment sociability that Staël cultivated in her own circles finds its manifest expression in her novel Corinne, ou l’Italie . While Staël’s literary work is often discussed in relation to the establishment of a Romantic topos, the influence of the Enlightenment on her work and her continued faith in les lumières ought not to be eclipsed. Staël draws on a variety of influences, not only German philosophy and English proto-romanticism, but also ideas from the French Enlightenment, which synthesize into a distinct pensée staëlienne that can be traced throughout her literary and philosophical works [Monchoux 1970, 372]. If Corinne is first and foremost a Romantic novel that foregrounds the love plot between Corinne and Oswald, it is as much a novel about the role of women in society, articulated through the figure of the femme de génie. The social conflicts that plague Corinne as a result of her talents and emancipated lifestyle are entangled within the amatory intrigue, which has led scholars to suggest that Corinne “n’est pas un roman d’amour, mais l’amour y est constamment essentiel” [Vaillant 2000, 57]. The novel can be read as having two plots: the love plot, which allows for the development of Romantic tropes – passion, suffering, the sublime experience of nature and ruins, melancholia, to name a few – and the plot of the femme de génie. The plot of the femme de génie is a fundamental component of the pensée staëlienne, finding its expression in Corinne through the trope of sociability. What’s more, Staël’s allegorical use of nations in the novel serves to qualify the cultural conditions of possibility for this ideal sociability, contrasting a modern model of gender relations and female autonomy in Italy with the more archaic mores represented by British society in Corinne . In this paper, I argue that through the constellation of sociability in Corinne and the national allegories that accompany it, Staël evokes an enduring partiality for an Enlightenment ideal of sociability that remains deeply connected with female emancipation. The lens of sociability allows for a re-articulation of the novel as a social critique of patriarchal society in juxtaposition with an alternative, enlightened social model. The first digital method employed is a social network analysis of Corinne . The application of social network analysis (SNA) to the study of literature is on the rise as scholars experiment with how this quantitative method from the domain of the social sciences can confirm or challenge existing theories in literary studies, identifying larger patterns or shedding new insights on specific works. A network is made up of nodes and edges; when applied to a literary text, nodes are very often the characters and edges are the interactions between characters [Moretti 2011, 81]. Network theory allows us to quantify plot and create models of literary texts. As Franco Moretti demonstrates, a networks approach to literature can be useful in several ways. One major change introduced by networks is the way in which they make visible all aspects of a plot at once. Networks reveal underlying structures in the process of reducing and abstracting the narrative. By creating models of a text, scholars can also intervene on the model and experiment, rethinking the hierarchy of characters and their centrality [Moretti 2011, 81–86]. As Moretti notes, removing the protagonist can reveal a completely altered network of the same text, and peripheral characters can point to subplots [Moretti 2011, 91]. Furthermore, as Andrew Piper, Syed Ahmed, Faiyaz Al-Zamal, and Derek Ruths suggest, the study of character networks in literature offers a way to study not only types and themes, they also “afford us the ability to understand the social imaginings of writers, periods, and genres” [Piper et al. forthcoming, 3]. While some scholars focus on individual texts, others use computational methods in large-scale studies of thousands of texts. David Bamman, Ted Underwood, and Noah Smith have used automatic text extraction on a vast corpus of 18th and 19th-century English novels to show that computational methods can support the same range of critical judgments offered by traditional literary scholarship about character types [Bamman et al. 2014, 375]. David Elson, Nicholas Dames, and Kathleen McKeown also used an automated approach on a large sample to examine the social communities portrayed by 19th-century British novels, suggesting that narrative voice is the most determinative of a novel’s social network, which counters the common scholarly emphasis placed on setting [Elson et al. 2010]. Another area of interest has been the use of social network analysis to understand the social features specific to different genres. Piper et al employed social network analysis to elucidate the social dynamics of detective fiction and the function of character types in the genre [Piper et al. forthcoming]. Whether SNA is applied to the study of a single text or several, scholars who employ digital methodologies to analyze literature all underscore the challenges of extracting data and constructing social networks from literary texts. While in plays, the interactions between characters can be easily quantified based on speech acts, translating character interactions computationally in a novel is not self-evident [Moretti 2011]. Scholars have approached this issue in a variety of ways. Some build their networks based on concrete interaction between characters that requires “active co-presence” [Piper et al. forthcoming]. For others, dialogue interactions suffice: Elson et al. construct networks relying on character name chunking and quoted speech attribution [Elson et al. 2010]. It is important however to distinguish between interactions and observations by characters about others [Agarwal et al. 2012]. Apoorv Agarwal, Augusto Corvalan, Jacob Jensen, and Owen Rambow conducted network analysis based on concrete interactions between characters, or, instances of observation where one character is thinking of or talking about another character. They also point to the suitability of different types of networks to understand different aspects of a text, and the usefulness of dynamic networks, where metrics such as directionality, weighting, and degree centrality can nuance analysis [Agarwal et al. 2012, 89–91]. In this study of Corinne , I apply social network analysis to a single text and in a vein similar to Moretti, I experiment with the model in order to shift the perspective from the love plot to the trope of sociability [Moretti 2011, 91]. The method applied to Corinne understands interactions between characters as taking place in the unit of the text that is topically consistent: the paragraph. Using the R statistical software environment, interactions, defined as instances of characters’ names appearing in the same paragraph, were extracted automatically. The more frequently this occurs, the stronger the interaction, thus the edge between the characters in the network has a higher weight. This is closest to Agarwal et al.’s approach in that it takes into account not only instances of physical interaction, but also instances where characters are being discussed or thought about by a third party. Based on the narrative context, it becomes clear whether or not the network is slanted more towards physical interaction or towards abstract interaction. For instance, Oswald and Corinne, the two protagonists in love, spend a significant amount of time thinking of one another, while other secondary characters only appear in physical interactions and do not become central narrative foci. Since the object of interest for this paper is sociability, the visualizations primarily reflect interaction involving “active co-presence” [Piper et al. forthcoming]. Instead of concluding my study with an analysis of the metrics of the character network, I sought to anchor my interpretation in the language of the text. The second digital method applied to the text executes a computational analysis of the semantic fields in the narrative by deciphering collocates of specific aspects of the novel. How does this relate, however, to the character network and the trope of sociability? In contrast to the large-scale studies that automatically extract data from novels and derive conclusions from the data alone, the benefit of applying computational methods to a single text is being able to tailor the approach with specific aims based on knowledge of the text. What’s more, while many computational studies of literature analyze data in isolation from the narrative, I combine the network analysis and the collocate-analysis with more traditional literary analysis of the novel. For the purposes of this study, I identified the collocates of two of the primary national poles of the novel, Italy and England. The collocates associated with these nations serve as a first point of entry to understand their symbolic significance to the thematic tensions surrounding gender and the trope of sociability in the novel. Through a Fisher’s exact test, it is possible to identify how many times collocates occur meaningfully (up to 25 words before or prior the countries of interest) versus how many times they would be expected to occur if equally distributed throughout the novel. As I will demonstrate, the collocate-analysis allows for a qualification of the tensions that underlie the social network. These two separate digital methodologies direct attention to and shed light on the issue of Enlightenment sociability in Staël’s novel. Sociability is an aspect of Corinne that receives little critical attention, but is no less significant to the novel and for situating Staël’s work more broadly. On first glance, a social network analysis of the interactions between characters in Corinne immediately highlights certain determining characteristics of the narrative (see Figure 1). The love plot constitutes the focus of the character network, with an overwhelming majority of interactions between Corinne and Oswald. This is unsurprising considering the lengthy portions of the narrative involving only these two characters. The love triangle also occupies a central place in the network; although Corinne and her sister Lucile only physically interact towards the end of the novel, Oswald is constantly comparing the two women as he is torn between his love for Corinne and his inculcated British values of domesticity. Likewise Lady Edgermond gains prominence through Oswald’s interactions with her in England and Corinne’s recounting of her past interactions with her stepmother. Another facet of the network that is evident is that it is strikingly British. Oswald, Lord and Lady Edgermond, Lucile, and Juliette constitute the majority of the characters in the network. Character Network: Undirected; colored by nationality (including the created nationality of “cosmopolitan” for Corinne and the “amis”); sized by Eigenvector centrality which calculates the approximate importance of each node based on how many edges it has that also attach to other nodes with a high number of edges. The size of the nodes is proportional to their centrality to the network. 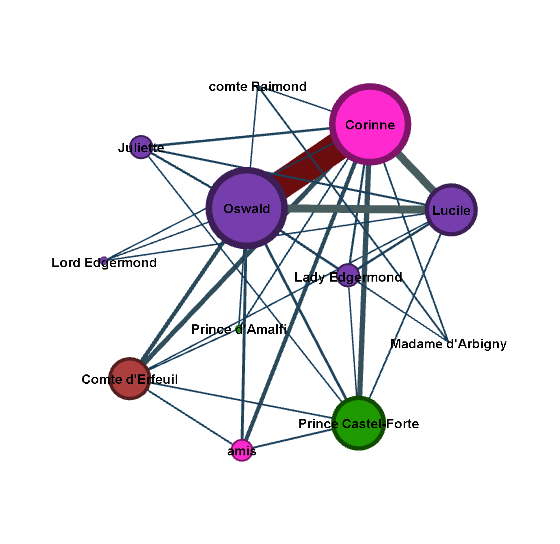 The character network of the novel as a whole indicates that Corinne is a novel about relationships and familial ties; the network becomes so profoundly insular that even the two characters who are simply close friends (the comte d’Erfeuil and the prince Castel-Forte) are connected in terms of co-occurrence within paragraphs to characters within the novel that they may or may not ever interact with face-to-face. Yet due to their high involvement in one another’s lives as friends, they end up discussing, with Oswald and Corinne, the entire array of characters who are central to the love plot. The network also reflects the manner in which certain parts of the novel are narrated in the first person and concern events anterior to the plot, causing characters with little relation to the intrigue, or at the very least, little active interaction with the main characters throughout the narrative, to populate the network, such as the comte de Raimond, Madame d’Arbigny, Lord Edgermond, and the prince d’Amalfi. The love plot and the accompanying drama however detract attention from a trope with equal significance that simply occupies a smaller portion of the novel, that of sociability. If the character network of the novel as a whole is fairly self-evident and hardly requires the intervention of digital tools, there is a consequential sub-network that is derived from the word amis, which is where the trope of sociability manifests itself (See Figure 2). While the novel features few characters in the traditional sense of the word, Corinne’s acquaintances in Italy who constitute her circle of sociability are repeatedly referred to in the plural amis. What’s more, the instances where the amis are present correspond with the scenes of sociability in the novel. Thus to create this network, I included amis as a character and tracked its co-occurrence in the text. When one focuses on this node, it reveals the primary network of sociability, without the distracting ties of love and kinship. Although it is a patently smaller network, it is profoundly symbolic of a network of Enlightenment sociability. It is composed of a French aristocrat, an Italian prince, an English Lord, Corinne, and the amis. I labeled both the amis and Corinne as “cosmopolitan” since Corinne can be considered an “expatriate,” a British woman living abroad, and the amis may include individuals of nationalities other than Italian who similarly have made a home abroad. The “Amis” network is striking because in contrast to the full network that displays varying degrees of edge weights, the “Amis” network has almost equal edge weights between characters. 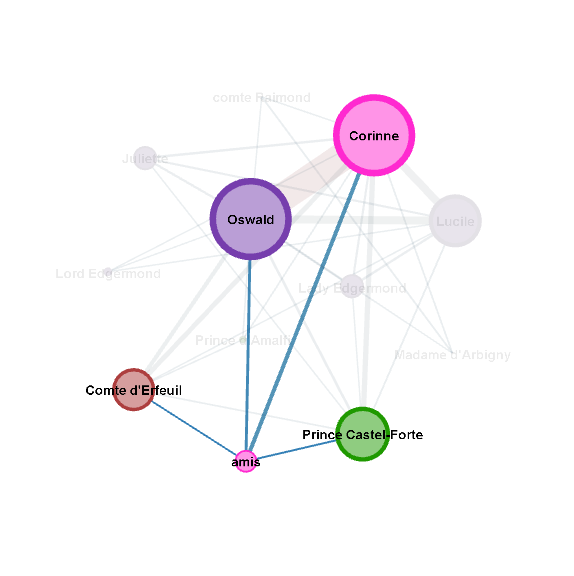 Corinne’s connections to the comte d’Erfeuil, the amis, and the prince Castel-Forte are all approximately equal. In addition, each of those characters, including Oswald, have the strongest connection to her over any other node in the entire network, which underscores the centrality of Corinne in this network of sociability as well as in the narrative as a whole. In the “Amis” network, we can interpret this relative equality of edge weights as indicative of moments in the narrative of equal exchange taking place in mixed company, manifesting the ideal mode of Enlightenment sociability. Staël portrays a vibrant cosmopolitan milieu of literary sociability in the chapters that take place at Corinne’s abode. Oswald describes her dwelling as “un mélange heureux de tout ce qu’il y avait de plus agréable dans les trois nations, française, anglaise et italienne; le goût de société, l’amour des lettres, et le sentiment des beaux-arts” [Staël 1985, 73]. The narrator notes that Corinne assembles a society of individuals every evening. The first occurrence of this follows Corinne’s public oratory, and the conversation centers on Corinne’s talent for improvisation and Italian poetry (C82). The most extensive scene of sociability occurs in Book VII, in which Corinne, Lord Nelvil, the prince Castel-Forte, the comte d’Erfeuil, and M. Edgermond engage in a lively debate over poetry, prose, and theater. Corinne speaks at length of Dante, Petrarch, Cesarotti, Ossian, Machiavelli, and Boccaccio. When discussing French literature, the comte d’Erfeuil refers to the literature under Louis XIV as the “perfect models” of prose, citing Bossuet, Montesquieu, Buffon, and La Bruyère (C176). They discuss classical theater and the English claim to theatrical glory, Shakespeare. Through Corinne’s character, Staël articulates theories of literature and engages in comparisons of national literatures. Corinne even echoes the philosophy of literature expressed in Staël’s treatise De la littérature, when she remarks that “l’observation du coeur humain est une source inépuisable pour la littérature” (C181). Corinne’s role in the “ Amis ” network is that of the femme de lettres, a woman who occupies a prominent place in the world of letters and maintains a regular circle of sociability that fosters intellectual and literary exchange. In this sense, Corinne represents the literary node in this network of sociability, and the core group of her acquaintances is composed of aristocratic men from different European nations. The characters in this network thus reconstruct an archetypal space of 18th-century sociability in which a distinguished woman assembles a society comprised of a majority of male attendees. While they are not men of letters per se, they exemplify the Enlightenment culture of intellectual participation. As Dan Edelstein notes, the Enlightenment depended on much more than simply “[penning] a treatise,” instead, the interaction between gens de lettres and gens du monde in the salons served as a precondition of the Enlightenment’s existence [Edelstein 2010, 13]. This small network of sociability thereby reflects on a micro scale the social composition of the French Enlightenment, which was highly aristocratic, literary, and male-dominated, barring certain exceptional women who established hubs of power in the world of letters through practices of sociability. Corinne’s circle represents at once the social composition of the French Enlightenment and exemplifies an ideal of sociability. If Staël succeeds in making this ideal a reality at Coppet, she transposes Coppet’s model of cosmopolitan sociability into fiction in Corinne . Corinne incarnates the autonomous femme de lettres who enjoys an eminent position in society as a result of her literary and artistic gifts, and her capacity to cultivate a rich circle of sociability. She unites a myriad of languages, arts, literary genres, and people in a utopian exchange. The “Amis” network in the novel thus represents a modern schema of male and female relations that centers around female intellectual agency and is conducive to female autonomy. The notion of a distinctly modern ethos is further developed through Staël’s symbolic treatment of the various nations in the novel, which the collocate-analysis underscores. The characters that compose the network of sociability are inseparable from their respective national identities. Nations in Staël’s Corinne become allegories of social values. The collocates of Italy and England thus allow us to qualify the social network of the characters. Specifically, the collocates of Italy elucidate the social conditions that make the “Amis” network possible. Staël’s representation of the different nationalities in Corinne has been interpreted in a variety of ways. Some scholars point to the distance between Staël’s portrayals of nations and historical reality, arguing that Staël’s cultural portraits perpetuate stereotypes. This interpretation, however, ignores the strategic purpose of these portrayals of nations in the tradition of Voltaire and Montesquieu, a technique used for social critique rather than historical accuracy. Many studies point to the politicization of the novel through these national representations, suggesting that Staël obliquely challenges Napoleon’s power by opposing literary arts to military spirit, idealizing a nation conquered by Napoleon, and characterizing the French in an unfavorably frivolous light. What Staël critiques in Corinne , however, extends beyond Napoleon, to the status of women and the possibilities afforded to them. Staël portrays Italy as a utopia, free from the social constraints of patriarchal societies. Michel Delon associates the social freedom in this idealized Italy with the ancient Roman traditions of public oratory and poetic creation in the novel [Delon 2008]. I argue, however, that the classical motif rather affords a theatricalized setting for a mode of sociability that, by contrast, is not reminiscent of ancient Rome but rather reminiscent of the ancien régime during the Enlightenment. The symbolic value of Italy and England are of the utmost importance in conveying the opposition between an ideal of Enlightenment sociability conducive to female emancipation and another form of society that precludes this. The comparative framework allows Staël to address the condition of women in different social contexts, specifically the issue of the social conditions that allow women to enjoy intellectual agency. This is a topic that Staël actively engages with in her theoretical works, particularly with respect to post-revolutionary society. The heightened climate of misogyny in France after the revolution is something that Staël had to confront firsthand as she endured political persecution, exile, and censorship. She addresses this issue explicitly in her theoretical works, pinpointing the non-institutionalized power that was available to women through practices of sociability under the ancien régime in contrast to post-revolutionary France. She asserts that “l’opinion” which reigned in the ancien régime was “l’ouvrage des dames distinguées par leur esprit et leur caractère” [Staël 1991, 336]. Staël reveals the shift in the status of women through her remarks on the stigma associated with publicity and writing under the two regimes, “Dans les monarchies, elles ont à craindre le ridicule, et dans les républiques la haine” (DL333). She criticizes the social and political trend since the French Revolution “de réduire les femmes à la plus absurde médiocrité” (DL335). Staël was far from alone in expressing these views; Stendhal observes that women “étaient des ‘déesses’ et sont devenues des ‘esclaves’” in the 19th century [Lilti 2005, 18]. What Staël theorizes concerning the political structure of the ancien régime as conducive to female agency has been similarly underscored by historians today [Ozouf 1995, 324–325]. The Revolution solidified the growing “malaise arising from now disturbingly fluid gender borders,” yielding ideological and legal setbacks for women linked to republican ideology [Gutwirth 1992, 51]. As Madelyn Gutwirth notes, the increasing relegation of women to the private sphere would prove to be the “single most unalterable measure effected by the Revolution,” surviving all the 19th century’s changes of regime [Gutwirth 1992, 371]. The idea of a “malaise” concerning fluid gender roles takes center stage in Corinne as Oswald struggles with Corinne’s emancipated life of celebrity in Italy, and ultimately privileges the relegation of women to the domestic sphere. Staël’s portrayals of England and Italy constitute key motifs that convey the thematic conflicts of the novel in relation to issues of gender and sociability. The romantic intrigue in Corinne is fueled by the social realities of cultural difference – Italy symbolizes a society that simultaneously supports and thrives on literary arts, in stark contrast to the representation of England in the novel [Guerlac 2005]. A computational analysis of the collocates of England and Italy sheds light on the social frameworks that Staël constructs through her representations of these two nations throughout the novel as a whole. 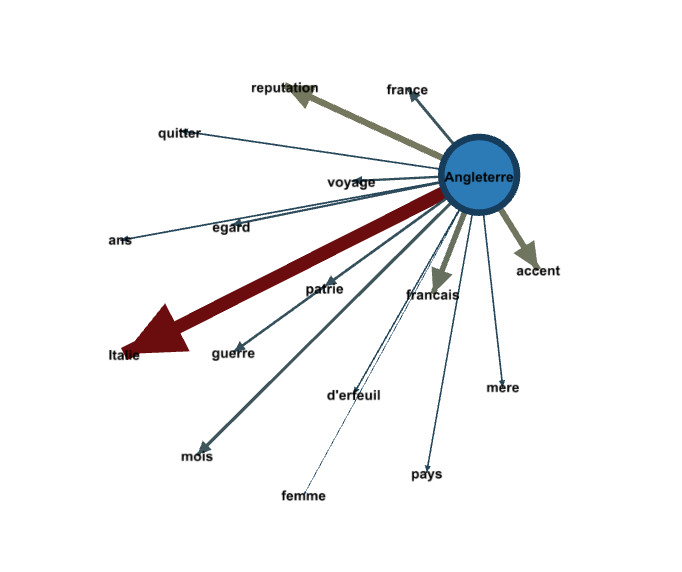 For ease of visualization, the variations such as “Italien(s), Italienne(s)” and “Anglais, Anglaise(s)” have been subsumed under “ Italie ” and “Angleterre” respectively. Conjunctions, articles, pronouns, and the verbs “avoir” and “être” have also been excluded from these networks to focus predominately on the more connotative and descriptive semantic fields employed. England Collocates: Directed; Nodes colored and sized by OutDegree (how many outgoing edges each node has); Edges weighted by observed over expected. England’s collocates seem to indicate that it serves primarily as a point of comparison in the novel (see Figure 3). Its collocate of the most frequency is in fact, Italy, seconded by “French,” “accent,” and “reputation.” A comparative framework effectively runs through the novel; Oswald compares Corinne to Lucile, Italy to England, and the other main characters engage in this same comparative activity. The collocate “French” points to the motif of national comparisons. “Accent” follows suit; one’s accent serves as a signifier of nationality. Upon his first interaction with Corinne, Oswald is shocked to hear Corinne speak English “avec ce pur accent national, ce pur accent insulaire qui presque jamais ne peut être imité sur le continent,” for he is unaware of her English origins (C68). This association is reinforced when Corinne speaks French with an English accent, which perplexes Oswald and the comte d’Erfeuil at this point in the narrative (C74). The collocates for England, moreover, are not particularly descriptive. Some relevant ones include “voyage, quitter, mois, ans, patrie,” which all relate to the plot and Oswald’s time spent away from England. The high frequency of “patrie” points to the centrality of the motif of being tied to one’s nation and its social values. “Reputation” appears to be the most significant non-comparative collocate for England. Social mores, which determine reputation, constitute the primary obstacle to the love plot and contribute to the tragic dénouement. Italy Collocates: Directed network; Nodes colored and sized by OutDegree (how many outgoing edges each node has); Edges weighted by observed over expected. The greater diversity of collocates associated with Italy and their descriptive nature reflect the inextricable association between Italy and the female protagonist (see Figure 4). The collocate of greatest frequency is of course “Angleterre,” emphasizing the juxtaposition between these two nations. Italy also has collocates that signal the topics that are important in the narrator’s discussions of the two nationalities: society, marriage, characters, and social mores. Yet overall, the kinds of collocates are markedly different than those of England and confer upon Italy a veritable personality. Italy is associated predominately with “belle, naturelle, vivacité, vrai.” The words “étrangers” and “partout” seem to underline the cosmopolitan nature that Staël ascribes to Italy, which has more to do with her allegorical use of Italy than a social reality. There are also words from the semantic field of the letters and the arts, “music, tragedy, theater,” and “penser, imagination,” which reflect the way in which Italy symbolizes a place that allows literary and artistic genius to flourish. “Imagination” is also significant because while it occurs 218 times in the novel in a multitude of contexts, it remains specifically one of Italy’s highest collocates. These collocates accentuate the comparative framework of the novel and contribute to the framing of Italy as the only nation in which Corinne’s genius can manifest itself in its full glory. The portrayal of Italy that these collocates construct reveals the close affinities between the country and the female protagonist. The association between Corinne and Italy is established explicitly from her first appearance in the novel, “‘regardez-la, c’est l’image de notre belle Italie… comme une admirable production de notre climat, de nos beaux-arts’” (C57). Corinne functions as an allegory of this idealized Italy, which I argue serves as a broader metaphor for female emancipation. Corinne represents a figure of literary and artistic genius; she is introduced as a woman who unites, “l’imagination, les tableaux, la vie brillante du midi, et cette connaissance, cette observation du coeur humain” (C55). What’s more, she is characterized by her “vivacité”; Oswald seeks to provoke, for example, her natural vivacity when they are gathered in her apartment discussing literature (C173). These are the very qualities for that matter, which solidify Oswald’s father’s disapproval of her. When she reveals to Oswald that their fathers had entertained the idea of their marriage, she describes her behavior during her encounter with lord Nelvil, “mon esprit, longtemps contenu, fut peut-être trop vif en brisant ses chaînes” and reflects “je parus à lord Nelvil une personne trop vive” (C373). The italicized portion of Corinne’s letter to Oswald underlines the socio-political weight that these words convey, insisting that women being erudite and holding institutional positions in society ought to be self-evident and commonplace. The tension between these two social codes and the way in which they respectively sanction or constrict the possibilities for women to develop their autonomous intellectual existence is reinforced by England’s collocate “reputation.” Given the “empire” that public opinion holds over Oswald, the close association between England and “reputation” would seem to reflect Oswald’s preoccupation with the social mores of his country (C243). “Reputation”, however, is primarily discussed in relation to the question of female reputation, and assumes a dual meaning for Corinne that accentuates the irreconcilability between the social values that Italy and England each represent. In Italy, Corinne’s reputation carries only positive connotations, “je suis venue m’établir à Rome, ma réputation s’est accrue” (C386). It is universally acknowledged, even by Lady Edgermond in the end, that Corinne “jouit… d’une très grande réputation littéraire,” a reputation for which she is publically known by the people of Italy (C506; C348). Yet her reputation as a woman is also characterized as precarious with respect to her interactions with Oswald, as something to be imprudently “risked” and “endangered” (C477, 279). Oswald experiences similar concerns, recognizing “qu’il la perdait à jamais de réputation” with any plan to bring Corinne with him to England out of wedlock (C411). What’s more, the reputation she acquires through her faculties in Italy takes a decidedly negative valence in England, causing Lady Edgermond to worry about the possibility that Corinne’s “extraordinary” reputation may harm her daughter’s chances at securing a promising future establishment (C383). The portrayal of Italy as the beacon of female emancipation and England as a paradigm of misogynistic prudery is accentuated through the jealousy that Oswald experiences during Corinne’s public display of her talents. The narrator signals to the reader in the beginning of the novel that there was nothing “plus contraire aux habitudes et aux opinions d’un Anglais que cette grande publicité donnée à la destinée d’une femme” (C49). In line with the British social values that Staël paints in Corinne , Oswald’s jealousy is not the product of a rival male character such as the prince Castel-Forte, but rather is derived from the public in general, “il eût voulu que Corinne, timide et réservée comme une Anglaise, possédât cependant pour lui seul son éloquence et son génie” (C192). Here, the tension between the social values of the two nations is patently manifest. Oswald loves and respects Corinne’s genius, yet he expresses a desire to restrict her talents to the private sphere. The simile “comme une Anglaise” denotes his desire for her to conform to the social mores of England. His adherence to the mores of his nation and his resulting emotional reaction to their transgression speaks to the high frequency collocate of “patrie” which runs through the narrative and reinforces the influence “des habitudes et des liens de la patrie” (C568). The prince Castel-Forte thus anticipates the influence that social pressure and the inculcated British values of female domesticity will wield over Oswald, in the absence of Corinne’s “empire,” which depends on the “pouvoir… de son charme” (C397). He echoes the aforementioned pull of one’s patrie. The love plot thus brings to the fore the tensions between the national allegories. While the tragedy of Corinne seems to stem from the tragic ending of the love plot, I suggest that the true locus of tragedy resides in the femme de génie plot. The novel begins by revealing Corinne in all of her brilliance and celebrity. She arrives at the Capitol in Rome for her public oration in a horse-drawn carriage. Roman poets read sonnets and odes to her, exalting her imagination before she begins her improvisation (C56). Her words are followed by outbursts of applause from the entire assembly, and the Senator crowns her a genius with a laurel wreath (C49-69). Once Corinne meets Oswald, however, the trajectory of the narrative moves from this apogee of glory through her physical, emotional, and intellectual demise as the result of her thwarted romantic hopes. As Gutwirth has shown, the difference produced in Corinne’s character that is produced can be read through the motif of silence, “le silence est une mort… non pas seulement pour Corinne, mais pour tous. Le roman tourne au réquisitoire contre le silence, mais surtout, il explore les conséquences du silence imposé à la femme” [Gutwirth 1982, 431]. Silence functions as the antithesis to empowerment. The national dichotomies accentuate this as Staël engages in a ruthless satire of British domesticity. Staël portrays the British female characters as well as the condition of life for women in England in a particularly unfavorable light. When Corinne recounts her childhood in England, she emphasizes her augmenting despair as she observes the dreary and confined domestic life that awaits her as an aristocratic woman in British society, where “une femme était faite pour soigner le ménage de son mari et la santé de ses enfants” (C365). The British women are characterized by an oppressive dullness, those who had some esprit “l’étouffaient comme une lueur importune” (C365). Corinne portrays England as the place where “ce qui était toujours sacrifié, c’étaient les plaisirs de l’imagination et de l’esprit” (C370). Italy’s collocates of imagination and the arts, which are precisely the qualities that allow Corinne to be the central node of the “Amis” network or network of sociability, are thus the qualities that make Corinne unwelcome in England. Corinne, unable to extinguish her imagination, remarks on how her talent ostracized her from British society, “je n’y faisais qu’un bruit importun à presque tout le monde” (C369). Her faculties, seen in Italy as a gift from God, were considered a curse in British society (C365). The only female character in the novel who emancipates herself from the oppressive, patriarchal social order is Corinne, who chooses to leave England and build a life of intellectual and social freedom for herself in Italy. Yet the paradox that results from this satire of British women is that Corinne too will be silenced, “La Sibylle ne rend plus d’oracles; son génie, son talent, tout est fini” (C431-32). The collocates associated with Italy that reflect Corinne’s character, of vivacity and imagination, in the end can no longer be associated with the protagonist. Corinne thus becomes the victim of British social mores too, “silenced” in that her intense romantic despair leads to her spiritual death as manifest by the decline of her imagination and talents, and ultimately, to her physical demise. Corinne’s lifestyle in Italy incarnates a cosmopolitan sociability that supports a fundamentally modern form of female emancipation. While the romantic intrigue in Corinne occupies the majority of the narrative, the lens of sociability allows a re-oriented focus onto the co-existing femme de génie plot. The motif of female genius and its social conditions of possibility is central to the novel, and critical for tracing the fil rouge of staëlian philosophy. Staël reveals her enduring partiality for the Enlightenment ideal of sociability that allowed women to exert substantial influence in the world of letters and construct a hub of power in society. For Staël, this model of female and male collaboration remains firmly attached to Enlightenment ideals, a mode of sociability that flourishes in Corinne’s milieu in Italy, yet is irreconciliable with the conventional social mores embodied by England that come to dominate the plot. The constellation of characters in the network of sociability recreates a utopian milieu that emulates Enlightenment sociability. Corinne as a femme de lettres assembles a circle of European aristocrats who participate in intellectual exchanges concerning literature, arts, and languages. This circle also constitutes a cosmopolitan sociability through the emphasis on the representation of different nations. Where the constellation of sociability in Corinne diverges from a standard understanding of 18th-century sociability is in its representation of literary and artistic genius through a female figure. Yet far from a fictitious ideal, the mode of cosmopolitan sociability in Corinne conducive to female intellectual ambition reflects the model that Staël constructs at Coppet through her appropriation and transformation of 18th-century practices. The network of sociability in the novel thus embodies a distinctly modern paragon of female and male relations that allow for female emancipation and intellectual activity. The allegories of the nations in the novel are instrumental in articulating this Enlightenment – or even staëlian – ideal. The collocates of Italy qualify the social conditions of possibility for the “Amis” network to exist, a model of sociability that centers around an autonomous femme de lettres, characterized by equal exchange, and favorable to female intellectual agency. The greater symbolic opposition between Italy and England manifests the tension between modernity and archaism; Corinne strives to teach Oswald, “comment on aime chez les modernes” [Lotterie 2000, 117]. The tragic ending of both plots, the love plot and the femme de génie plot, demonstrates the triumph of archaism. Corinne’s inability to reconcile her intellectual ambition with her romantic desires frames love as a “cultural possibility,” in this case precluded by Oswald’s adherence to the “British” values portrayed in the novel [Lotterie 2000, 124]. The persistent tension between the social values incarnated by Italy and those of England comes to fruition in the dénouement with Corinne’s tragic demise, victim of the archaic social values that render her identity as a femme de génie irreconciliable with her love for Oswald. The romantic intrigue is thus inscribed within the larger issue of gender relations and the status of women in society. Given the historical moment in which Staël is writing, the tensions in Corinne between her fictitious Italy and England can thus be read as a commentary on post-revolutionary French society, a thematization of the opposition between Enlightenment and republican ideals. The network of sociability in Staël’s Corinne orients our focus towards an alternative sociocultural possibility. I am grateful to Mark Algee-Hewitt for his support with the computational aspects of this project, as well as for his insightful feedback on the article throughout the writing process. I would also like to thank Léonard Burnand for welcoming me to the Institut Benjamin Constant, where I completed a significant portion of my research on Madame de Staël and the Groupe de Coppet. On Staël and Romanticism, see [Isbell 2003], [Monchoux 1970], and [Brix 2002]; for a work of feminist criticism on Staël, see [Gutwirth 1978]. For biographical studies of Staël’s life and work, see Simone Balayé, Madame de Staël: Lumières et liberté (Klincksieck, 1979) and Madame de Staël: écrire, lutter, vivre (Droz, 1994), Sergine Dixon, Germaine de Staël, Daughter of the Enlightenment (Amherst, Mass: Prometheus Books, 2007), Francine Du Plessix Gray, Germaine de Staël: The First Modern Woman (New York: Atlas, 2008), Angelica Goodden, Madame de Staël: the dangerous exile (Oxford University Press, 2008), Michel Winock, Madame de Staël (Paris: Fayard, 2010). For a detailed account of Staël’s relations with Napoleon, see Paul Gautier, Madame de Staël et Napoléon (HardPress, 2013). For a brief history of the intellectual activity at Coppet, see Etienne Hofmann and François Rosset, Le groupe de Coppet: une constellation d’intellectuels européens (Collection le savoir suisse, 2005). See Karyna Szmurlo, ed., Germaine de Staël: Forging a Politics of Mediation (Oxford: Voltaire Foundation, Oxford University, 2011). See also Marie-Claire Hoock-Demarle, “Un lieu d’interculturalité franco-allemande: le réseau épistolaire de Coppet,” Romantisme 21, no. 73 (1991): 19–28. For more on the role of sociability in Staël’s political thought, see Steven Kale, “Women, Salons and Sociability as Constitutional Problems in the Political Writings of Madame de Staël” ( Historical Reflections/Réflexions Historiques 32.2 (2006): 309-338); see also Staël’s Considérations sur les principaux événemens de la Révolution française , where she discusses the history of sociability in France. Florence Lotterie shows for instance in ““Madame de Staël. La littérature comme «philosophie sensible»,”” Romantisme 34, no. 124 (2004), how Staël’s view of literature as a form of activism, and her faith in the social utility of literature and philosophy for progress, is an Enlightenment ideal. For more on Staël's synthesis of the 18th century's reflections on aesthetics, philosophy, and society, see the volume edited by Tili Boon Cuillé and Karyna Szmurlo, Staël’s Philosophy of the Passions: Sensibility, Society and the Sister Arts (Lewisburg, PA: Bucknell University Press, 2013). “[ Corinne is] not a love story, but love is constantly essential to it”. All translations from French to English of secondary literature and of Corinne have been executed by myself. On social network analysis, see Stanley Wasserman and Katherine Faust, Social Network Analysis: Methods and Applications (New York: Cambridge University Press, 1994); and David Knoke and Song Yang, Social Network Analysis (Los Angeles: Sage Publications, 2008). See for instance Agarwal et al.’s study of Lewis Carroll’s Alice in Wonderland , which shows how networks can provide insights into the roles of characters in a narrative. See Mark Algee-Hewitt, Ryan Heuser, and Franco Moretti’s Pamphlet 10, “On Paragraphs. Scale, Themes, and Narrative For,” of the Stanford Literary Lab, http://litlab.stanford.edu/pamphlets/. All visualizations have been produced through the open-source network analysis and visualization software Gephi. “a happy medley of all that is most agreeable in the English, French and Italian nations; the taste for society, the love of literature, and a passion for the fine arts” (Subsequent citations from Corinne will be prefixed by a “C”). Some salon hostesses of the Enlightenment such as Mme Geoffrin and Julie de Lespinasse limited the number of women who could come to their salons. Similarly, Staël hosted a majority of men, in Paris and at Coppet. See Maria Teodora Comsa, Melanie Conroy, Dan Edelstein, Chloe Summers Edmondson, and Claude Willan, “The French Enlightenment Network,” The Journal of Modern History 88, no. 3 (2016): 495-534. See for instance Angelica Goodden, The Dangerous Exile , Robert Casillo, The Empire of Stereotypes: Germaine de Staël and the Idea of Italy (Macmillan: New York, 2006), and Joseph Luzzi, Romantic Europe and the Ghost of Italy (New Haven, Conn.: Yale University Press, 2008). Edward Ousselin, “Germaine de Staël et Voltaire: de l’usage des modèles littéraires étrangers” ( Dalhousie French Studies 92 (2010): 65-73). See Suzanne Guerlac “Writing the Nation (Mme de Stael),” French Forum 30, no. 3 (2005): 43–56, Susan Tenenbaum, “Corinne: Political Polemics and the Theory of the novel” in The Novel’s Seductions: Staël’s Corinne in Critical Inquiry (Bucknell University Press, 1999): 154-164, Giulia Pacini, “Hidden Politics in Germaine de Staël's Corinne ou l'Italie” ( French Forum . Vol. 24. No. 2. University of Nebraska Press, 1999), and Edward Ousselin, “Germaine de Staël et Voltaire: de l'usage des modèles littéraires étrangers” ( Dalhousie French Studies 92 (2010): 65-73). On the culture of misogyny in post-revolutionary France and women’s social and political setbacks in the 19th century, see [Gutwirth 1992]. “the work of women distinguished by their esprit and character” (subsequent citations of De la littérature will be prefixed by “DL”). “In monarchies, women feared ridicule, and in republics hatred,” underlining the misogyny associated with republicanism. See Appendix for a full list of the nation collocates. This supports what many scholars have noted, see for instance Suzanne Guerlac, “Writing the Nation (Mme de Stael),” French Forum 30, no. 3 (2005): 43–56. Agarwal et al. 2012 Agarwal, Apoorv, Augusto Corvalan, Jacob Jensen, and Owen Rambow. “Social network analysis of Alice in Wonderland .” In Workshop on Computational Linguistics for Literature , pp. 88-96. 2012. Baczko 2008 Baczko, Bronisław. Politiques de la Révolution française . Gallimard, (2008). Bamman et al. 2014 Bamman, David, Ted Underwood, and Noah A. Smith. “A Bayesian Mixed Effects Model of Literary Character.” In ACL (1), pp. 370-379. 2014. Brix 2002 Brixm, Michel. “Romantisme versus Romanticisme : Stendhal Contradicteur de L’esthétique Staëlienne,” Cahiers Staeliens , no. 53 (2002): 69–92. Delon 2008 Delon, Michel. “Corinne ou la femme auteur.” In Cahiers staeliens 59 (2008): 13–25. Edelstein 2010 Edelstein, Dan. The Enlightenment: A Genealogy . Chicago: University of Chicago Press, (2010). Elson et al. 2010 Elson, David K., Nicholas Dames, and Kathleen R. McKeown. “Extracting social networks from literary fiction.” In Proceedings of the 48th annual meeting of the association for computational linguistics , pp. 138-147. Association for Computational Linguistics, 2010. Gray 2008 Gray, Francine du Plessix. Madame de Staël: The First Modern Woman . New York: Atlas & Co. (2008). Guerlac 2005 Guerlac, Suzanne. “Writing the Nation (Mme de Stael).” French Forum 30.3 (2005): 43–56. Project MUSE. Gutwirth 1978 Gutwirth, Madelyn. Mme de Staël, Novelist: Emergence of the Woman as Artist . Champaign, IL: University of Illinois Press (1978). Gutwirth 1982 Gutwirth, Madelyn. “Du silence de Corinne et de sa parole.” In Benjamin Constant, Madame de Staël et le groupe de Coppet: actes du deuxième Congrès de Lausanne à l’occasion du 150e anniversaire de Benjamin Constant et du troisième Colloque de Coppet, 15-19 juillet 1980 . Ed. Étienne Hofmann. Oxford: The Voltaire Foundation (1982). Gutwirth 1992 Gutwirth, Madelyn. The Twilight of the Goddesses: Women and Representation in the French Revolutionary Era . New Brunswick, N.J.: Rutgers University Press (1992). Hesse 2001 Hesse, Carla Alison. The Other Enlightenment: How French Women Became Modern . Princeton, N.J.: Princeton University Press (2001). Isbell 2003 Isbell, John Claiborn. The Birth of a European Romanticism: Truth and Propaganda in Staël’s de l’Allemagne . Cambridge, UK: Cambridge University Press (2003). Kale 2006 Kale, Steven D. “Women, Salons and Sociability as Constitutional Problems in the Political Writings of Madame de Staël.” Historical Reflections/Réflexions Historiques 32, no. 2 (2006): 309-338. Lilti 2005 Lilti, Antoine. Le monde des salons: sociabilité et mondanité à Paris au XVIIIe siècle . Paris: Fayard (2005). Lotterie 2000 Lotterie, Florence. “‘La puissance d’aimer’: progrès et sensibilité dans Corinne ou l’Italie.” In Une mélodie intellectuelle: Corinne ou l’Italie, de Germaine de Staël . Ed. Christine Planté and Christine Pouzoulet. Centre d’étude du XIXe siècle - Université Paul-Valéry (2000). Monchoux 1970 Monchoux, André. “La place de Mme de Staël parmi les théoriciens du Romantisme Français.” Madame de Staël et l’Europe: colloque de Coppet, (18-24 juillet 1966) organisé pour la célébration du deuxième centenaire de la naissance de Madame de Staël (1766-1966) . Ed. Sven Ulric Palme. Editions Klinksiek (1970). Moretti 2011 Moretti, Franco. “Network theory, plot analysis.” New Left Review (2011). Ozouf 1995 Ozouf, Mona. Les mots des femmes: essai sur la singularité française . Paris: Fayard (1995). Piper et al. forthcoming Piper, Andrew, Syed Ahmed, Faiyaz Al-Zamal, and Derek Ruths. “Communities of Detection: Detective Fiction and Social Network Analysis”, Digital Literary Studies (forthcoming). Staël 1985 Staël, Madame de. Corinne ou l’Italie . Ed. Simone Balayé. Paris: Gallimard, (1985). Staël 1991 Staël, Madame de. De la littérature . Ed. Gérard Gengembre and Jean Goldzink. Paris: Garnier Flammarion (1991). Vaillant 2000 Vaillant, Alain. “De l’Essai sur les fictions à Corinne ou l’Italie : théorie et pratique de la sublimité romanesque.” In Une mélodie intellectuelle: Corinne ou l’Italie, de Germaine de Staël. Ed . Christine Planté and Christine Pouzoulet. Centre d’étude du XIXe siècle - Université Paul-Valéry (2000).